Black Friday has finally arrived and this year it’s bigger than ever. To celebrate William Hill is releasing special Flash Odds offers – both online and retail – every single hour on Friday from 9am to 9pm. With William Hill, Black Friday is the only sale where the price goes up, so head online or in store on Friday 23rd November and enjoy fantastic, preferential odds for a limited time. Each Flash Odds sale begins on the hour and lasts 10 minutes. Black Friday offers with William Hill: How does it work? 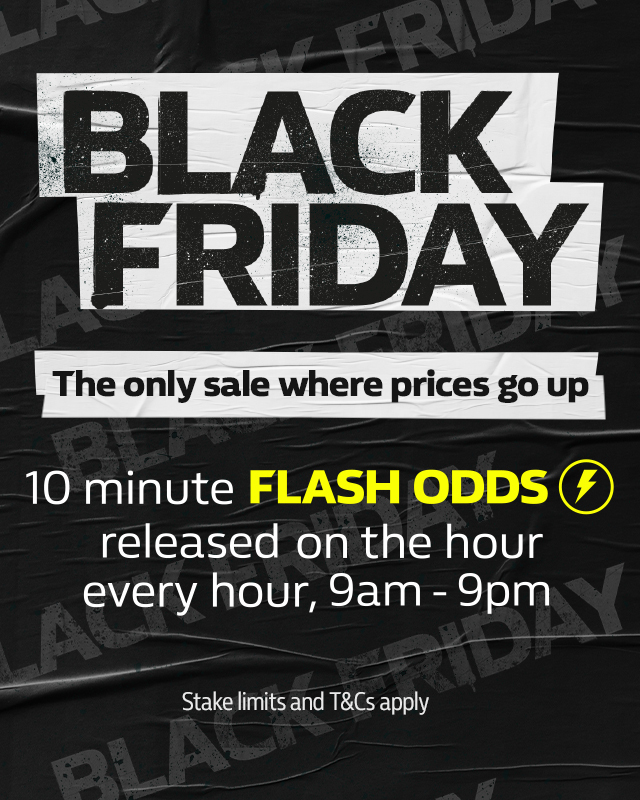 When it come to sports betting, Black Friday is all about Flash Odds – 10-minute markets with preferential odds released on the hour, every hour across key betting markets, from 9am – 9pm. William Hill’s special offers will be available for a limited amount of time with maximum stake limits, so when it’s gone it’s gone. Flash Odds are sudden opportunity to make the most of a substantially enhanced price on a popular market. Flash in every sense of the word, Flash odds are only ever available for a finite amount of time. Get to grips with Flash Odds here. Black Friday 2018: What should I bet on? As always, there is a fine array for sporting fixtures available to bet on this Black Friday weekend. Premier League action returns, so why not log in or visit one of our shops and place a bet on any of the exciting fixtures happening this weekend? Get in on all the betting action from the English Premier League, Championship and Football League with William Hill. Or how about enjoying our Black Friday flash odds on Horse Racing betting instead? Get the best Jump Season markets and odds taking place this weekend. Available across ALL channels (Online and Retail).